A Kelley Blue Book Best Resale Vale Award winner, the 2012 Maxima full-size sedan delivers not only roomy comfort for as many as five but also a strong dose of Eurostyle fun-to-drive. The V6 engine manages a nice compromise between high-horsepower and laudable fuel economy. 2012 Nissan maxima is a great vehicle for the price I would suggest. 2012 Nissan maxima has a v6 engine. It has a great sound system. The steering is good. I like the cvt transmission at first it is a little weird coming from a automatic transmission to the cvt but now it seems like it is a smoother shift. It has dual exhaust a sunroof. The maxima I have has cloth seats and they are electric. The 2012 Nissan maxima is a reliable vehicle have not had any major problems with the car in 3 years of having it. The breaks are great it can stop on the dime and it has a way you can switch from automatic driving to manual. One negative I have about it is the price of gas it takes premium gas which makes filling it up a little more expensive. 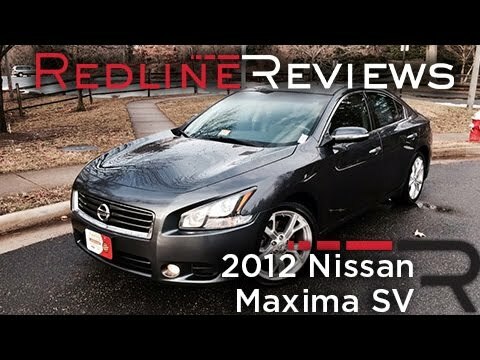 Overall it is a great car and would advise anyone on getting the 2012 Nissan maxima. My car known to friends and family as "jet". My 2012 Maxima is six years old and is still in excellent running condition. When entering the freeway I know it will go from zero to sixty within seconds. Miles per gallon is around 22 on surface streets, I wish it was more economical but the car is dependable and I have never been stranded when traveling in California, Nevada or Utah. This car provides an excellent navigation system and hands free phone service. Both systems are easy to use. It has an automatic sunscreen for the rear window, a feature that delights our passengers. And the front seats warm up for those cold winter days. The 2012 Maxima is a great ride all around. The 3. 5 V6 has plenty of take off, and stretch out power with plenty to spare! Power locks and windows, fully adjustable leather seats/heated. Heated steering wheel. It has an awesome sounding Bose stereo with xm. Suspension really hugs the curves. Mine was bought used certified. It has 107k miles on it. No major problems, right side front wheel bearing replaced at 80k, which is kind of early foremost wheel bearings. Transmission slipped twice going into reverse, but it checked out ok. Alignment is a little shaky.